Flirtman doesn’t always frequent the hard-core girly gogos but rather sometimes needs a more sedate evening listening to some live music but in this town that’s easier said than done. For this week’s wander we headed down to Soi Diana to chill out in the Heartbeat Bar and also do a quick rundown of some of the top 10 music venues that you can catch live bands. 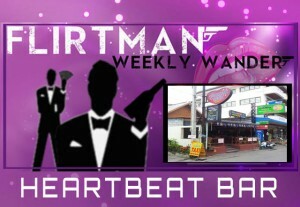 The Heartbeat bar is located just at the rear side of Champagne a gogo and sits alongside a little food court area. It’s a mainly outdoor style bar with a covered roof and has the choice of bamboo type table and chairs (near the soi diana entrance) or high stool bar type area further inside. The five piece “heartbeat” band are actually quite good when compared to some of the other efforts in town and the clarity of their lyrics are a little more crisper too. What seems to be a favourite in this bar is the willing participation of the foreign audience to be allowed to get up and grab a guitar and jam along with the band. If you can chant a tune out then the band will try and accomodate you and these guys can follow along with even the most amatuerish singer. The can rattle out some more modern stuff too rather than stick to the mainstay of hotel california etc and with beers only 90 baht then you can enjoy a bit of entertainment without breaking the bank. It should be noted that there are a few good looking hostess/waitresses in this bar too but they mainly hang out around the door area so if you want some company then best choose a seat around there and give the 30second stare to catch their eye. All the above are cheap beer priced bars that will have you singing along…just bear in mind some are more louder and heavier than others.